So, you know all about the American Revolution, right? And you know how in 1776, the Declaration of Independence was signed. And then we became a country, right? Er... no. Not really. At all. But that just shows you how much I remember from junior year American History (sorry, Ms. Fischer). The American Revolution officially ended in 1783 with the signing of the Treaty of Paris. Here was the United States of America! But... they had a problem. Each of the thirteen states had its own government. It had its own currency. Traveling between the states was like traveling to a different country. There was no central government to negotiate international trades or help the states if they got into trouble. Something had to be done. And that something was the Constitutional Convention in 1787 where delegates from twelve of the thirteen states came together to build a new government. 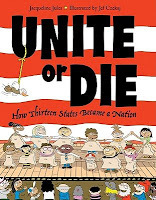 Unite or Die gives a great overview of the Constitutional Convention. Jacqueline Jules's concise text explains why we needed it. It explains what issues the delegates discussed and what they debated. And it explains how our Constitution was created and designed to grow with us as a nation. And the information is presented through children performing a school play. Some of the kids are dressed up as states, some as forefathers. Jef Czekaj pays great attention to detail and includes small things that kids will love to notice. The effect is similar to The Scrambled States of America (which I also loved). An afterword presents more info and a great section of notes clarifies items presented throughout the book in an accessible way. A bibliography is included. This is a great introduction to the Constitution and to American government. It's accessible and fun and I'll take pleasure in recommending it. The SLJ review suggests pairing it with Lane Smith's John, Paul, George, and Ben and I'll heartily second that. Happy Nonfiction Monday! Anastasia's got the roundup at Picture Book of the Day (where you can ALSO enter to win a free virtual author visit to your class! ).